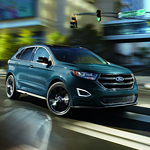 The 2019 Ford Edge is one of the top midsize SUVs available in the market. The turbocharged EcoBoost 2.0-liter four-cylinder is one of the top SUVs from Ford currently. It’s also one of the top midsize SUVs in its class, ranked highly for performance, interiors, and safety. The acceleration and power in the Edge has been finely tuned for 2019. You get a turbocharged Ecoboost 2.0-liter engine. The four-cylinder is standard and produces 250 horsepower. All Edge models come with an eight-speed automatic transmission. However, the Edge ST is more suited for performance drivers who want to feel the pick-up when they accelerate. You’ll get 335 horsepower with a turbocharged V6. The handling and suspension have been updated as well. Most drivers that love the Edge like it for the fuel economy as well as comfort inside without skimping on the power. Test drive the latest Edge at Ray Price Ford.